Before I get into my review of Dragon Age 2, I’d like to put my thoughts into context for you. I’m a fan of the games that BioWare puts out and I enjoy the mechanics. Primarily, I play RPG style video games to relax and to shut my brain off. It’s increasing harder for me to watch movies, for example, and do nothing else. Playing games like Dragon Age: Origins allows me to turn off the brain-neuron connection switch and have fun. Mind you, I am a min/maxer… There. My secret is out. Phew! Anyway, when I get into a video game, I’m looking at it as a casual experience with the ability to cheat modify my characters in a way that gives me better flexibility and playing style. Story is important to me, but for some games *coughs Final Fantasy XII* I get confused if there’s no recap or summary after the side quests portion. I played both Dragon Age: Origins and Dragon Age: Awakenings, along with a few of the add-ons you could download. My playing style for those games was casual but bloody, and my main character was a female warrior. So, for this game I decided to play a mage, in part because the uber fancy hardcover edition of the player’s guide recommended that it’d be more fun. The first thing that popped into my head when I started to play this game was: “Oh my, this is a gorgeous game.” The second thing? “Mages are badass.” The graphics, set design and scenery are the best I’ve seen in a fantasy style video game. There is detail, lots and lots of fine detail, that adds so much texture you feel like you’re playing in a set. I opted to port over the story from my previously-played games, which affected the plot only slightly. A few characters from Dragon Age: Origins and Dragon Age: Awakenings make an appearance — even ones that I killed. Even though you play as a refugee from Ferelden and this is still firmly planted in the Dragon Age universe, I don’t really consider Dragon Age 2 to be a sequel to the first one at all. In my mind, there are quite a few differences between the games. First? This is what I would call an RPG-style video game for beginners. The interface was so intuitive and so casual that even if you screwed up royally you could fix it by buying a bottle of “Maker’s Sigh” to redistribute your attributes and special powerz. The only thing that would have made it even more simpler, would have been an auto-optimize mechanic where you press a button and you automatically outfit your character with the best equipment. Admittedly, I was kind of surprised Bioware didn’t go that route, because all signs — including color coding of equipment and a star rating system — were pointing in that direction. There is one limitation, in that if you want the uber-special equipment that you have to purchase through the different vendors, spend your gold wisely ’cause you ain’t getting a lot of it when you loot corpses. Just sayin’. Second, the story arc is much more epic and less immediate than the other two games. There’s no recruiting of factions to fight against a common foe; this is a story that’s centered around your character — Hawke — as a prelude to something else, something we don’t see in this game. There are three acts to the story, three main events that propel Hawke from a refugee to a wealthy noble, from a noble to a Champion, from a Champion to a defender. Each event is not related to the other, though there are threads that weave in between the two. In these two ways, I feel this game would have been better off with a different name. 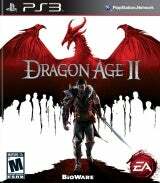 Dragon Age 2 is, in my opinion, a little misleading because it’s not the same game or style of play. The style of play in this game fits all three story arcs, so it’s important to explore and get everything done that you need to do in Kirkwall before you complete the main quest. I had a guide book, but I rarely used it. Once I knew what the main plot thread was, which is not indicated in the game, then I focused on the side quests. Both potential side quests and plot threads are indicated by a little flag above the person’s head. I found this changed my game, because I was missing a ton of stuff to run over and grab that flag. Then, I’d wonder what I missed, so I’d go back and backtrack. The tone of these quests change from chapter to chapter. In the first arc, you are broke. Dead broke. But? You need coin. A lot of it, too. So the reason for doing the side quests is to get you the coin you need to complete the first story arc. In the second arc, the side quests turn to more investigative-style play, where there are mysteries to uncover as part of the main plot in the third arc. The second arc is really where the heart of the game is, and it’s a place where you’ll learn more about Meredith. Although there’s a build up to the Qunari, I have an opinion about their presences in the third act, which I won’t get into here due to spoilers. There’s not a lot of side quests in the third arc, but I recommend you complete them anyway to get a better impact when you reach the final confrontation. By far, I felt that the character quests in Dragon Age 2 were a vast improvement over the previous incarnation, because most of them affect the game in a real and tangible way. Would I grab this game again? Yes. Is it as stunning as the first installment? Yes and no. Do you need to play the first game to play this one? No, and for all the reasons I listed above, I feel your opinion of the game will change if you do. If you like dark fantasy-style RPGs, a consistent and tight storyline, beautiful and amazing graphics/artwork — then you’ll like Dragon Age 2. If you’re picky about your games, however, and fall under the umbrella of “serious” gamer, then I would play the demo to see if Dragon Age 2 is right for you.